Metrodome have announced three titles for UK DVD release at the end of September – the survival thriller Black Rock, the crime drama Everybody Has a Plan and the horror thriller Citadel – each on what looks like movie-only discs. Three young women – Sarah (Kate Bosworth), Abby (Katie Aselton) and Lou (Lake Bell) – get together for a private campout at one of the iconic settings of their childhood, an empty island off the coast of Maine, to renew their bond of sisterhood. They quickly learn, though, that the island is anything but empty, when they encounter three recently-returned servicemen, who have come to the island to hunt. A misunderstanding quickly turns to tragedy, and the three women soon find themselves the targets of the hunt. What started as a simple playdate to recall old times is now a race for survival. Described by The Independent as "A gruesome, grimly fascinating fight for survival" and Screen Daily as "A feminist Deliverance," Black Rock will be released on UK DVD on 23rd September 2013 by Metrodome Distribution at the RRP of £17.99. Everybody Has a Plan tells the story of Agustín (played by Viggo Mortensen), a man desperate to abandon what for him has become, after years of living a frustrating existence in Buenos Aires. After the death of his twin brother, Pedro, Agustín decides to start a new life, adopting the identity of his brother and returning to the mysterious region of the Delta, in the Tigre, where they lived when they were boys. However, shortly after his return, Agustín will find himself unwillingly involved in the dangerous criminal world that was a part of his brother’s life. Word on this one is less enthusiastic than the pair above, a more optimistic response from Film.com concluding that the film "could use more energy and fire. But it pulls off the tricky feat of being both commanding and subtle, emerging with its dignity intact." 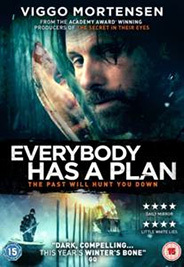 Everybody Has a Plan will be released on UK DVD on 23rd December 2013 by Metrodome Entertainment at the RRP of £17.99. 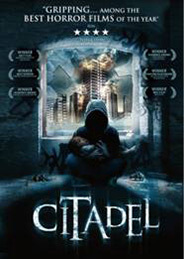 Described by Fangoria as "An eerie atmospheric strong debut…truly scary" and BloodyDisgusting.com as "An incredibly well shot, terrifying and freakish horror drama that’s loaded with violence, scares and intensity," Citadel will be released on UK DVD on 30th September 2013 by Metrodome Distribution at the RRP of £15.99.